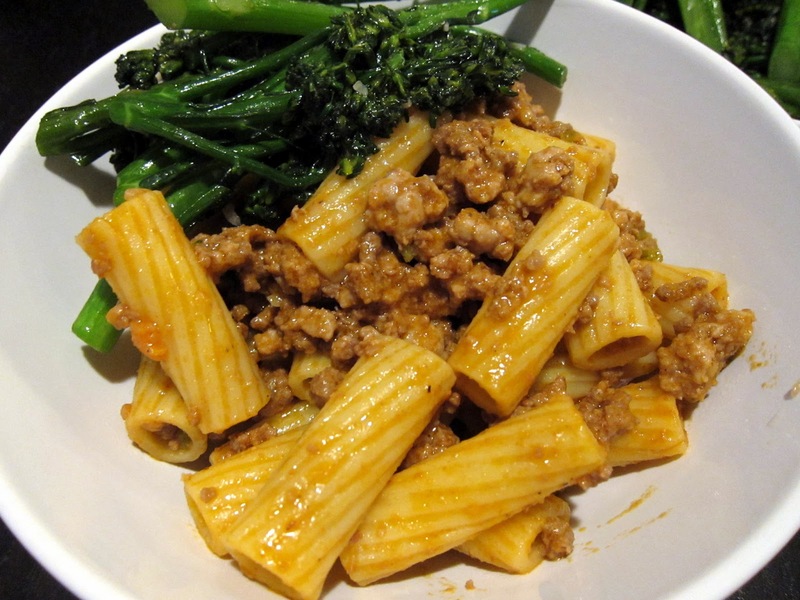 Rigatoni with Ragu Bolognese – Overworked. Underfed. 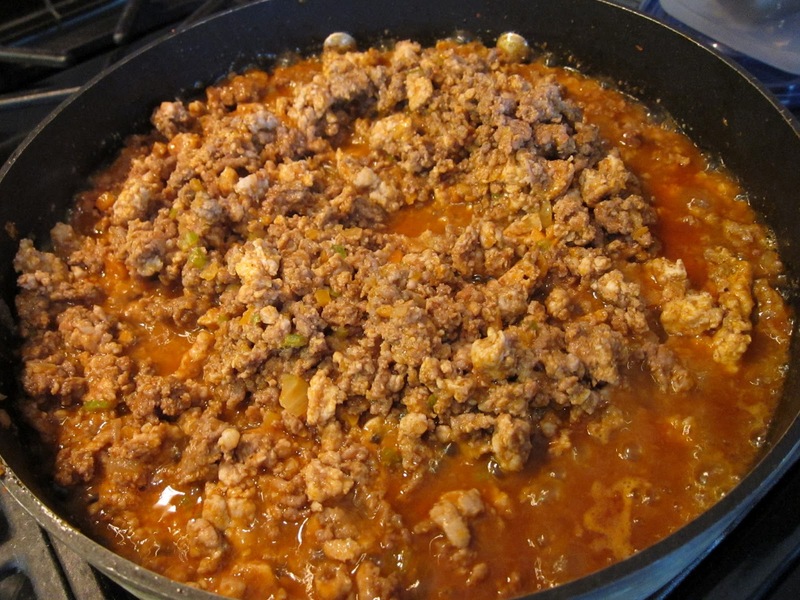 I love food that is hearty and comforting, stews, slow braises, and meat sauce anything just to name a few. When I go out to Italian restaurants, I have to force myself from ordering the ragu or bolognese. I can’t help but gravitate to it because I know it’s probably gonna be solid with no surprises. I figure if I’m going out to try a new restaurant, then I should order something different. Anyways, I came across this recipe from Darin Dines and I wanted to see if I could recreate this yumminess. 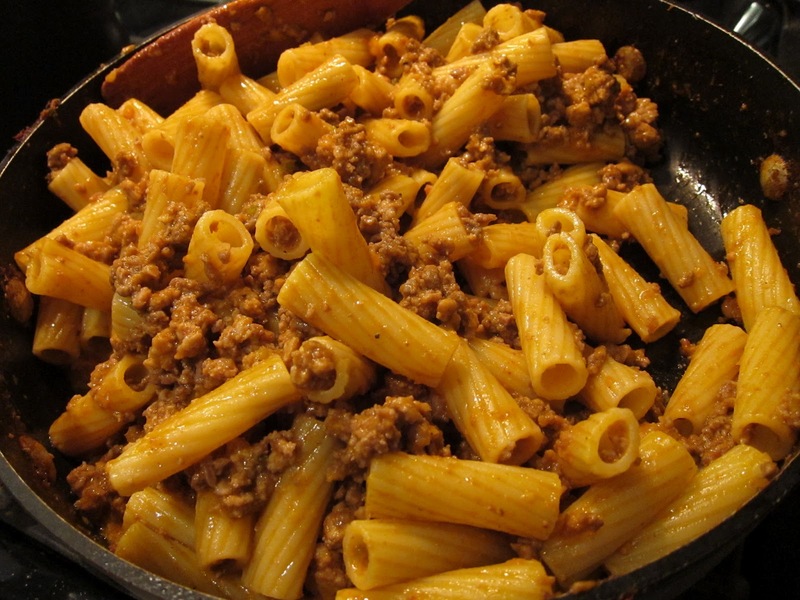 If I could get my ragu fix at home, maybe I wouldn’t gravitate toward it so much when I’m out. 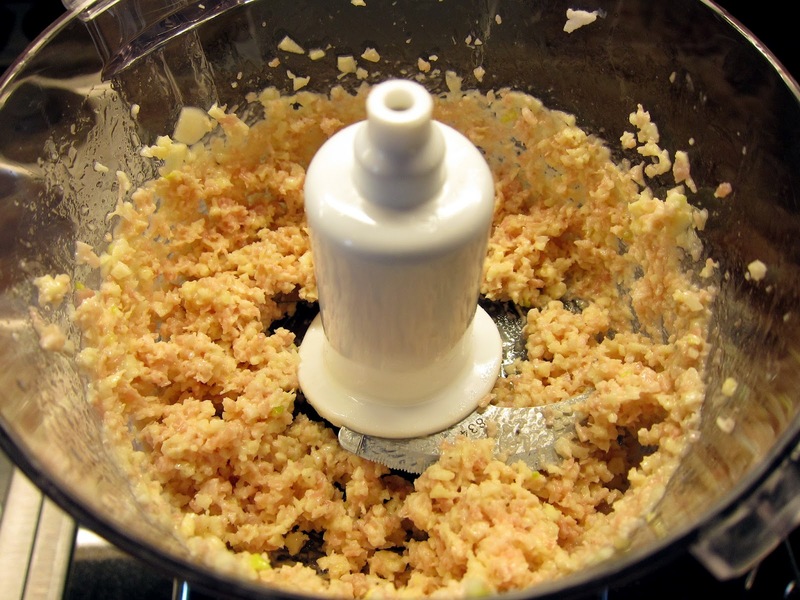 So the recipe is very interesting because you use a food processor to munch up a ton of garlic and pancetta. 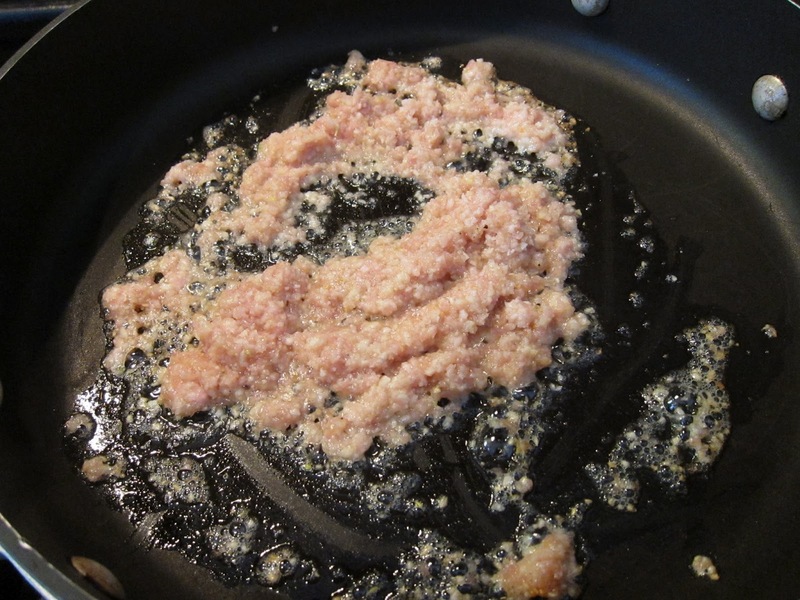 You then fry this up and try to resist the intoxicating aroma of fat, pork, and garlic making love in your pan. Then add the soffrito. 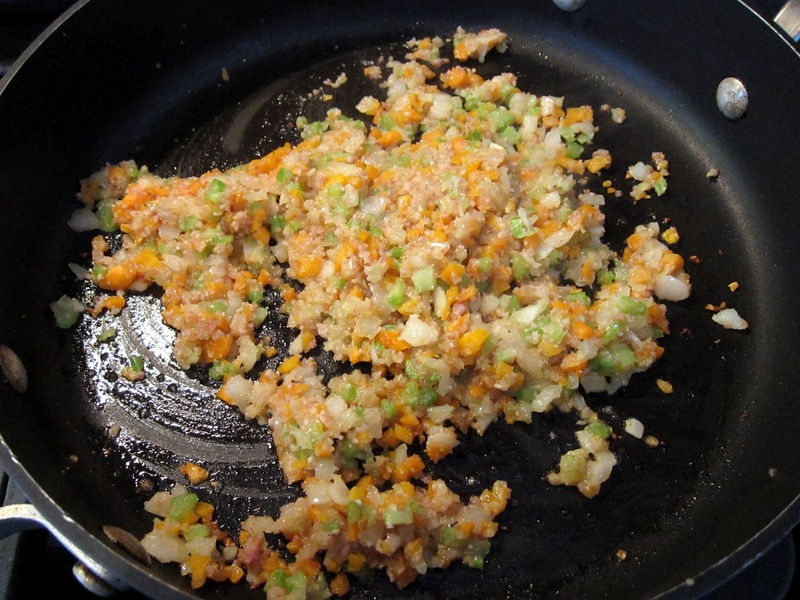 I wasn’t quite sure what this was made up of, but I just used celery, onions, and tomatoes. 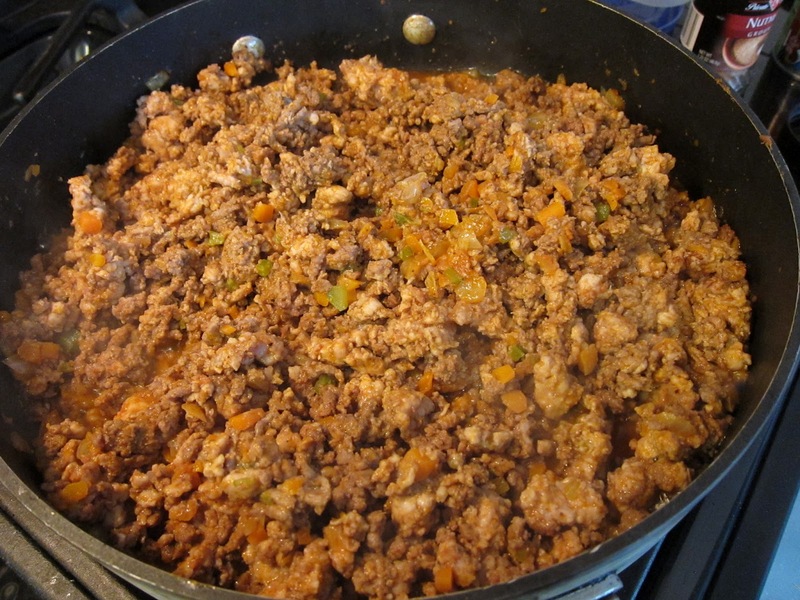 Add the tomato paste and meat. Reduce for 2 hours. I cheated because I didn’t know the recipe required so much time. I think I only simmered it for an hour or maybe less. Add milk for some creaminess and the pasta. There were all these instruction about finishing it off with more olive oil, butter, cheese, etc. I just used what I had on hand. 6. Cook the pasta with the sauce for 2 minutes, stirring gently with a rubber spatula so you don’t tear the pasta. Add pasta water if the pasta is dry and sticky instead of slippery and glistening. 7. 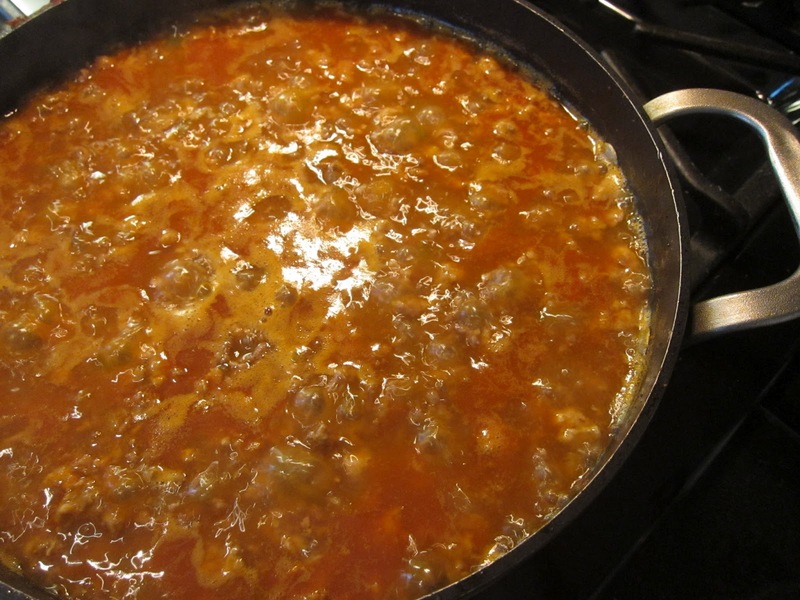 Turn off the heat and add the finishing quality olive oil, stirring vigorously and shaking the pan to emulsify the sauce. The dish turned out pretty nice, but it was a whole lot of effort. I suppose it’s one of the better ragus I’ve made, but I guess that’s not saying much since I usually use store bought Italian sausage combined with jarred tomato sauce. It was meaty, and had a nice saltiness from the pancetta. Even though the recipe called for so much garlic, it really was not overpowering. The recipe makes a lot of sauce. I actually saved half it and froze it to eat later. Still turned out well, but a little on the dry side. I totally forgot about the finish steps to add the butter, olive oil, and stock. That probably would have revived it to its original meaty juicy state. I think I’ll tuck this recipe in my collection and remember to actually cook it for 2 hours next time. And yes, I’ll probably still order ragu when I dine out. I love it too much.